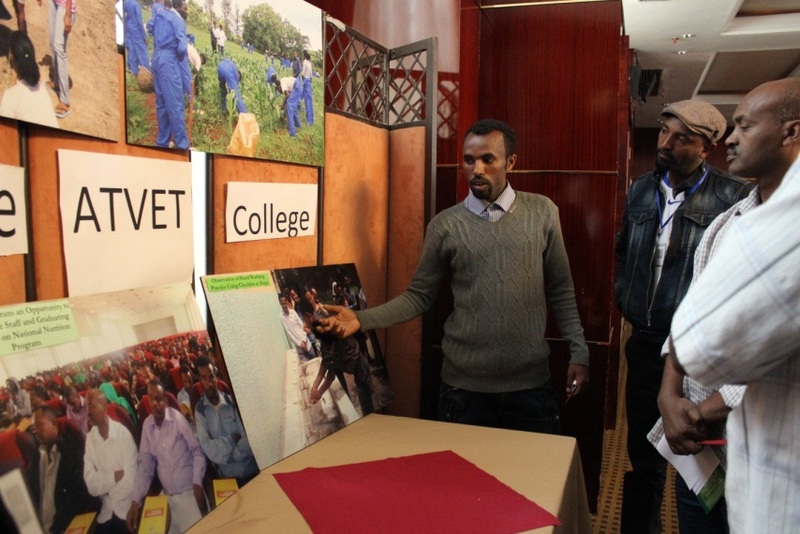 Haile Berihulay explains how Alage ATVET College incorporates the concept of nutrition-sensitive agriculture into their training to other institutions gathered for an annual review meeting on November 20, 2014. Ziway, Ethiopia—Spanning more than 10,000 acres, the Alage Agricultural Technical Vocational Education and Training (ATVET) College sits nestled between the Rift Valley lakes of Abiyata and Shalla some 150 miles south of Addis Ababa. When Haile Berihulay, 28, started teaching at the college six years ago, there were no planned classes, practical training or coursework to address nutrition-sensitive agriculture as part of the curriculum. But, in 2012, the Alage ATVET College was among 12 institutions of higher education selected to participate in the Empowering New Generations to Improve Nutrition and Economic Opportunities (ENGINE) project, which is funded by the U.S. Agency for International Development and led by Save the Children. Jhpiego, the project partner focused on preservice education, has been working in collaboration with the government of Ethiopia to shift curriculum to a competency-based program that integrates key concepts in nutrition with traditional plant- and animal-based sciences to build the capacity of agricultural agents. Through this integrated approach, surrounding communities and farmers are empowered to tackle issues of malnutrition that contribute to maternal and child mortality in the area. Diversifying production and consumption is just one way in which students at the college learn to improve the nutritional outcomes of their families. Through Jhpiego’s work, Berihulay began to see significant improvements in the curriculum. Using its Standards-Based Management and Recognition (SBM-R®) approach, Jhpiego has introduced and implemented quality monitoring tools to strengthen the nutrition curriculum and improve the capacity of instructors in designing and delivering competency-based nutrition education. An estimated 2,038 agricultural agents have graduated from the 12 schools that have benefited from the ENGINE project. The Alage ATVET College has increasingly been recognized for its huge campus and growing enrollment. Students are agricultural agents whose major role is assisting the farming community to maximize productivity by sharing their technical knowledge in farming systems, application of fertilizers, introduction of new varieties/breeds, diversification and reducing post-harvest loss—all with the goal of having a positive impact on nutrition. “Jhpiego has been supporting us in many ways, especially in building our faculty’s capacity to become better and effective instructors …. The college has been delivering quality education and the number of graduating students passing the national center of competency exam is increasing every year,” says Berihulay.